Yes, I know we could have been a bit neater with the pastry edge – we’ll just go ahead and call it rustic, ok? 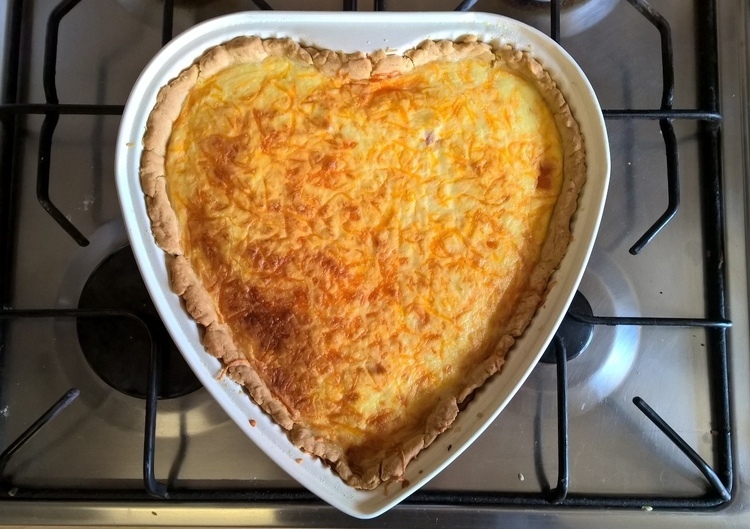 We didn’t know it at the time, but it turned out to be very appropriate that my daughter and I chose to use a heart-shaped tin to make this quiche in because it was the nicest quiche I’ve ever had. I take no credit for that, it’s all down to the recipe, which isn’t one of mine. Usually I find quiche a little bit blah – I’ll happily eat it, but it doesn’t rock my world…until now…this one is rich and indulgent and we all loved it. The recipe we used is Ultimate Quiche Lorraine from BBC Good Food. The only thing we changed is that we used ham and Red Leicester cheese, rather than the lardons and Gruyère cheese specified in the recipe – it’s probably even nicer with lardons and Gruyère, but we chose to use ingredients that we already had. Oh and there was nutmeg in the original recipe that we didn’t use. Once you’ve got the base recipe though, you can use whatever cooked meat/vegetables that you like, it doesn’t have to be a Quiche Lorraine. 1. Put the flour, butter, egg yolk and 4 tsp cold water into a food processor. Using the pulse button, process until the mix binds. Tip the pastry onto a lightly floured surface, gather into a smooth ball, then roll out as thinly as you can. 2. Line a 23 x 2.5cm loose-bottomed, fluted flan tin, easing the pastry into the base, and then press it into the flutes. Or if you’re us, a heart shaped tin instead! Our pastry broke apart a lot when when tried to transfer it from the counter to the tin, but we just patched it up in the tin and it was fine. Prick the base with a fork and chill for 10 minutes. 2. While pastry is chilling, place a baking sheet in the oven and heat at 180C/350F. Line the inside of the pastry case with foil, shiny side down, fill with dry beans and bake on the hot sheet for 15 mins. Remove foil and beans and bake for 4-5 mins more until the pastry is pale golden. 3. Once the pastry is cooked, cut three quarters of the cheese into small dice and finely grate the rest. Scatter the diced cheese and ham over the bottom of the pastry case. Using a spoon, beat the crème fraîche to slacken it then slowly beat in the double cream. Mix in the well beaten eggs. Season with a little salt and pepper. 5. Lower the oven to 170C/340F Bake for about 25 mins, or until golden and softly set (the centre should not feel too firm). Let the quiche settle for 4-5 mins, then remove from the tin. Serve freshly baked, or cold. Perfect for lunch with a salad, or as part of a party buffet. Happy quiche-ing! Why yes, and a heart-shaped beer too (that’s a thing right?). I’m starving and will be over straight away. Abandon plan! Abandon plan! You’re too late Sue, it’s gone! Yummy! But I must admit, I’ve never heard of lardons. 🙂 I should have just googled them rather than admit my ignorance, but what the heck! Chunky cubes of bacon – yum! That’s why I figured ham would be fine as a substitute when that’s all I had. Like JM — what in the blazes is a lardon? And I didn’t Google because I’m too lazy. Lardons are little chunky bacon cubes. It’s not a very well known word actually.